Stretched over seven episodes, The War is quite a different piece of work than Burns’ career-defining and genre-reinventing series The Civil War. One of his motivating purposes for getting the series done was reportedly his desire to get as many of these first-person accounts of the conflict down on film while there were still enough veterans and civilians alive to tell them. This focus on being told what happened by those who were actually there gives the series a wholly different perspective than the Civil War, which by necessity had to utilize historian talking-heads and the narration of first-person accounts. While that series hardly skimped on the grungy details, the soothing voices, gentle music, and sepia-tone feel of the whole thing allowed viewers a little more distance…. 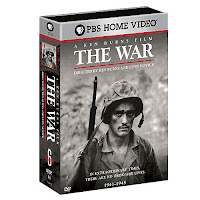 The War has been out on DVD for a little while now (it first broadcast on PBS last year), but the cold, harsh winter possibly soon upon us might still provide a good time to sit down and take in all of its 15-plus hours. Well worth the time. You can read the full review at filmcritic.com.